Shortly after 2am on Thursday 16 October 1943, Volunteer John Blake, at Loop Head lookout post, reported to the air message centre at Limerick that an aircraft of unknown nationality had been sighted about a mile to the north of the post. It was flying from the west in an easterly direction at 500ft, with both its internal and navigation lights on. On reaching the coast the aircraft followed the route to Foynes taken by British and American civilian flying boats. The arrival over Kilkee of the Heinkel 111 of Luftwaffe specialist group 3F 123 was timed to coincide with the arrival of the scheduled transatlantic flight from New York. The aircraft had on board an Irish citizen, John Francis O’Reilly, who landed by parachute in the County Clare townland of Moveen. He and his associate, John Kenny, who ‘dropped in’ on the night of 19 December, were the last of the motley band of fanatics, adventurers and misfits in the pay of Nazi Germany who landed in neutral Ireland as spies. John Francis O’Reilly was born on 7 August 1916 into a family of four boys and three girls. His father, Bernard ‘Casement’ O’Reilly, had been an RIC constable who got his nickname from being one of the RIC party that arrested Sir Roger Casement. Following his education at Kilkee National School and Kilrush Christian Brothers School, O’Reilly successfully passed the civil service clerical officer’s examination in April 1936 and was appointed to the customs and excise office at Rosslare, Co. Wexford. After eighteen months’ service he resigned because, according to a Garda report, ‘he was dissatisfied with [the] salary and prospects, having failed to pass a test in oral Irish in which he claimed he was unjustly treated. He was not sacked.’ In February 1939 he decided to test his vocation to the religious life. ‘I had been having a rather hectic time in Rosslare and the peacefulness of Buckfast Abbey… appealed to me… [However]… after a period of three weeks I found that I was not suited to the monastic life and I left.’ He worked as a kitchen porter in hotels in Penzance and Falmouth before going to London, where he was employed digging air-raid shelters, as a barman in Kentish Town, as an unsuccessful door-to-door book salesman and in the Dominion Hotel, Lancaster Gate. His mother claimed that during his time in England O’Reilly had been employed as a salesman by the Electrolux Company and that he had been a front office manager in the Dominion Hotel. Leaving London in early May 1940 he went to Jersey, where he worked as a farm labourer. Shortly after the occupation of the Channel Islands by German forces he made the acquaintance of a German soldier who was anxious to learn English, and through him O’Reilly got a job that ‘consisted of my having control of [the] issue of butter, cheese and meat, by weight, to approximately forty or fifty soldiers. The place where I was working was a sort of canteen or pantry and I had complete charge of it.’ He then worked as an English-speaking overseer and translator with a German military engineering unit that employed civilian workers. In 1953 O’Reilly wrote a series of articles for the Sunday Dispatch about his wartime experiences in which he claimed that he proposed the formation of an Irish brigade to senior German officers. According to Mark Hull, he worked his way ‘up the collaboration ladder… to eventually acting as a translator between the island commander, Major Georg Wilhelm Prinz zu Waldeck und Pyrmont, and the Irish workers who decided to remain in Jersey’. He then recruited a group of Irishmen for work in Germany. His compatriots caused considerable trouble to the German authorities, arriving back at their lodgings late at night, singing and shouting, and switching on the factory lights in contravention of the blackout regulations. ‘I was there until about the middle of September  when I was informed by my boss that the Ministry of Propaganda in Berlin had made enquiries about me … I was invited to Berlin for interview. I went there on the 24/9/’41, and made a voice test on radio. As an Irish national, O’Reilly was a valuable find for the head of the Irland-Redaktion, Dr Hans Hartmann. Irland-Redaktion was the Irish service of German radio, with offices at Rundfunkhaus, Berlin. Among the Irish expatriates in Berlin with whom O’Reilly worked were Francis Stuart and Frank Ryan. Stuart harboured suspicions that O’Reilly was a double agent and regarded him as a mercenary. O’Reilly claimed to have been introduced to William Joyce (Lord Haw-Haw) on his first day at Rundfunkhaus and wrote about an encounter with a mysterious woman ‘who influenced his future’. He also claimed to have addressed his application, in English, to Goebbels personally, telling him that he would ‘accept any kind of employment in his ministry that might further Germany’s effort against England. I mentioned that I had a fluent knowledge of the Irish language and a good knowledge of German’. Initially he was involved in writing scripts on topics of Irish interest for broadcasting by others. He used the name Pat O’Brien when he first began broadcasting, changing back to his own name later. The first broadcast in his own name that was monitored by Irish military intelligence was transmitted on 28 October 1942 and dealt with religion. Ireland under the Penal Laws was compared with Russia under communist rule. His broadcasts before Christmas 1942 included personal messages to his family and friends in County Clare and to his friends in the Rosslare rugby club. His family purchased a radio when their neighbours told them of his broadcasts. Disagreements with Dr Hartmann soon surfaced and eventually led O’Reilly to seek other employment opportunities with the Nazis. He met an American, Howard Marggraff, who was acting as a freelance recruiter for both Abwher (German military intelligence) and its rival, the SD (Sicherheitdienst, the Nazi Party security service). In September 1942 O’Reilly began training with Marineabteilung (Naval section) of Abwher 1 at Bremen in preparation for a mission to Northern Ireland. (Abwher 1 had responsibility for the collection of foreign intelligence material.) He was initially highly regarded by the Germans, and his claimed connection with the IRA since boyhood was considered to be an additional bonus. He began an intensive radio communications course in October 1942 and subsequently claimed that his Morse code transmission rate was considerably higher than that of the other trainees. He also received training in both normal photography and microphotography. The original plan was to land him on the west coast of Ireland from a U-boat in 1943, but when this plan was dropped he returned to Berlin, intending to resume his radio work. Here he was approached by the SS with a view to being inserted into Ireland by air. He received further radio training as well as instruction in Allied aircraft and aircrew personnel recognition. This aspect of his training was designed to provide information for the Luftwaffe, while his SD mission was to infiltrate political groups in England who were believed by the SS to be unhappy with the conduct of the war by the British government. He was also to make contact with Scottish and Welsh nationalists and to report on the British and American army in Northern Ireland as well as on Royal Navy activity there. O’Reilly met Oscar Pfaus, the Abwher contact with the IRA, who asked him to pass on greetings to Maurice Twomey, the former IRA chief of staff. Mark Hull observes that, ‘given O’Reilly’s tendency to tell less than the full truth, his own explanation of his mission should be regarded with caution’. In relation to his flight home, O’Reilly claimed that he had travelled by rail from Berlin to Stuttgart and then by air from Lyons to Barcelona, Madrid and Lisbon. There he made contact with a German friend who advised him that it would be difficult to get permission from the British authorities to fly on to the United Kingdom. Arbour Hill prison, where O’Reilly was held from December 1943 until May 1945. He said that he was driven to a remote part of the airfield and that the flight to Ireland commenced at 11.10pm. When he had landed he recovered his suitcase, which contained a radio transmitter, and hid his parachute. After wandering in the dark for some time he saw a light in a house and went in, where ‘I found a man there who was somewhat drunk and I could get no satisfaction from him’. Eventually he met local farmers, the Collins brothers, who were preparing to drive cattle to a fair at Doonbeg. He told them that he had come from Dublin and that he intended visiting an acquaintance, Murty Carmody, in Kilkee. Having lost his way after leaving Doonbeg railway station he had been travelling all night. Stephen Collins, who had carried O’Reilly’s suitcase, noted that it was very heavy and that it was very unevenly balanced. When he remarked on this O’Reilly said that it was packed with books. At about 7.30pm Sergeant Carroll of Kilkee Garda station was given confidential information that ‘a strange man wearing grey clothes and strong boots and carrying a heavy valise’ had made enquiries about the way from Moveen to Kilkee and that he had arrived on foot in the town earlier that morning. The sergeant was aware of the overflight and suspected that the person in question was John Francis O’Reilly. When he came voluntarily to the Garda station he was interviewed by Garda Superintendent Dawson. He told the superintendent, without hesitation, that he had ‘jumped out of a plane and come down by parachute that morning at Moveen’ and, producing his passport, asked if he had broken any law. The superintendent said that his method of entry into the state was a breach of the Emergency Powers regulations, according to which arrivals and departures from the state could only be made at designated sea and airports. O’Reilly then asked the superintendent ‘if he had landed by parachute at one of these airports would his entry have been in order’. On the morning following his arrest he made a lengthy statement to Superintendent Dawson, following which he was detained under the Offences against the State Act. On the morning of 18 December 1943 he was brought to Garda Headquarters, Dublin, where he was interrogated by Superintendent Dawson and two military intelligence officers before being lodged in Arbour Hill military detention barracks. The family home was searched for the wireless transmitter, which was found in a suitcase hidden in the yard, but the cardboard folder that contained the transmission codes could not be found. The Gardaí were strongly of the opinion that O’Reilly’s father had burned the folder. As a search for the parachute—which involved members of the Garda Síochána, the LSF, the LDF and local civilians—had failed to find it, O’Reilly was brought from Arbour Hill in February 1944 and showed the Gardaí where it was hidden along with small spades and packing material for the radio set. Money that he had given to his mother for safekeeping was handed over to the Gardaí and the radio set was examined by a Garda technical officer. O’Reilly’s passport was subjected to detailed forensic examination and a number of anomalies in the entries quickly became apparent. A detention order under the Offences against the State Act was signed by the minister for justice on Christmas Eve, 1943. Between December 1943 and May 1944 O’Reilly was interviewed on a number of occasions by military intelligence. He made observations on the bombings of Hamburg and Berlin, the morale of the German civilian population, geopolitical matters relating to Turkey and the Axis, the relationship between Ireland and Germany, the Irish community in Germany and the Breton nationalist movement. Military intelligence was also told how, in August 1943, O’Reilly had returned to the Channel Islands, where he recruited John Kenny of Kilcommon, Killarney, who had been employed as a civilian driver by German forces. They concluded that ‘Kenny, who is uneducated and untrained, claims to know little of the arrangements other than that he was to work under O’Reilly’. Army signals corps operators used his radio set and recorded call sign transmissions on a number of occasions. O’Reilly refused to have his fingerprints taken, claiming that ‘as an unconvicted prisoner he was not liable for fingerprinting’. In July 1944 he was told that he would shortly be moved from a cell at the front of the prison to a smaller one on the ground floor, which would make an escape attempt more difficult. He obtained a map of Dublin City from the duty officer and familiarised himself with the roads in the vicinity of the prison. He was checked by the prison staff at 11.30pm on 4 July 1944 and broke out during the following morning. As this was an extremely difficult feat army authorities suspected collusion. O’Reilly walked by the building that housed military intelligence after his escape. He hid until daylight in a potato field near the Phoenix Park, from where he walked to the Inchicore home of a distant relative. He was given breakfast and, having borrowed five pounds for a train fare, he left for Kingsbridge Station. The reality was that O’Reilly hid under a seat, and when he emerged he told the other passengers that he had travelled from England to Limerick to see his wife, who had been taken ill. Following his escape a nationwide manhunt was mounted; wanted posters were issued, offering a £500 reward. O’Reilly said that he stayed with friends, whom he would not identify, in Limerick for three days. He borrowed a bicycle to travel to Kilkee. Shortly after he set out from Limerick City the bicycle chain broke and he was forced to walk to Kilkee. He was arrested within three hours of his arrival there and was back in Arbour Hill military prison on the following day. He said that his escape was a protest ‘against the unfair attitude adopted towards me by the authorities on the matter of my detention … I feel that the seven months detention that I had done has covered any irregularities in my method of coming home’. He asserted that he had had no assistance from anyone outside the prison and that no one either outside or inside the prison had any knowledge of his intention to escape. The incident was reported in the English newspapers as well as in Time magazine and led to questions in Dáil Éireann and in Stormont. On July 17 1944 his father wrote to the Garda superintendent at Kilrush, ‘I beg to apply for the reward offered for the arrest of John Francis O’Reilly who escaped from Arbour Hill barracks on 6th inst. Bernard O’Reilly’. The question of O’Reilly himself ultimately benefiting from the reward for his own recapture was the subject of correspondence between military intelligence and the Garda authorities. It was decided that, despite obvious reservations, the reward should be paid as there was no restriction put on the source of the information when the Garda notice was issued. The ‘red house’, Infirmary Road, headquarters of military intelligence during the Emergency-O’Reilly walked right past it while escaping in July 1944. Later Garda informant reports show that he had been in contact with Seán McBride and had given him information relating to Francis Stuart. The Dublin newspapers reported on 4 October 1945 that O’Reilly had purchased the Esplanade Hotel, Parkgate Street, for £7,100. In 1947 he applied for a passport to travel to the USA; while the Irish authorities did not refuse it, O’Reilly chose not to proceed with the application. On 27 March 1947 he appeared in court on a charge of possessing a revolver and 50 rounds of ammunition without a firearms certificate. He was fined £3 and claimed that he needed the weapon for his personal protection. During the court proceedings reference was made to an event that had taken place on 11 November 1945, when a group of British ex-servicemen, wearing emblems and poppies, had marched through the Esplanade Hotel. At the same time O’Reilly had been attacked by a serving British soldier. O’Reilly married shortly after his release and fathered six children. The marriage broke up and the children were taken into care. The body of his wife was found in Hume Street in 18 April 1956. She was the victim of a botched abortion performed by Nurse Cadden, who was convicted and sentenced for her murder. O’Reilly worked abroad for many years before returning to work in the Shannon industrial estate in the early 1960s. He remarried and fathered another child. At the age of 54 he was seriously injured in a road accident in London and died in the Middlesex Hospital on 4 May 1971. He was buried in Glasnevin cemetery in an unmarked grave. Nothing further is known about John Kenny after his release in 1945. 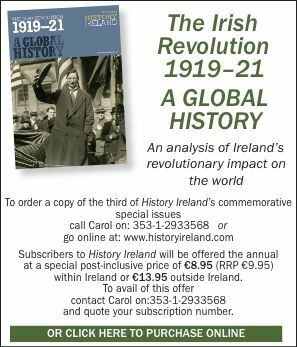 Anthony Kinsella is a member of the Military History Society of Ireland. M. Hull, Irish secrets: German espionage in wartime Ireland, 1939–1945 (Dublin, 2003). D. O’Donoghue, Hitler’s Irish voices (Belfast, 1998).